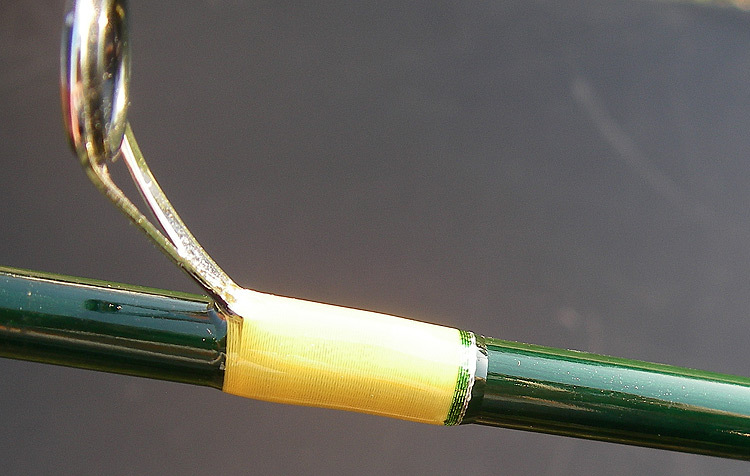 This rod is replacement for one that I enjoyed fishing for many summers and have recently sold. Batson Enterprises' IST1382F steelhead float rod can only be best described as a wet noodle with very minimal backbone. How it is classified as a steelhead float rod is a mystery to me, but what I can say from several seasons of experience, it is one heck of a great drift rod for smallmouth, catfish and stocker trout fishing. Its length is the only hindrance, as the 11'6" blank is a 2pc. 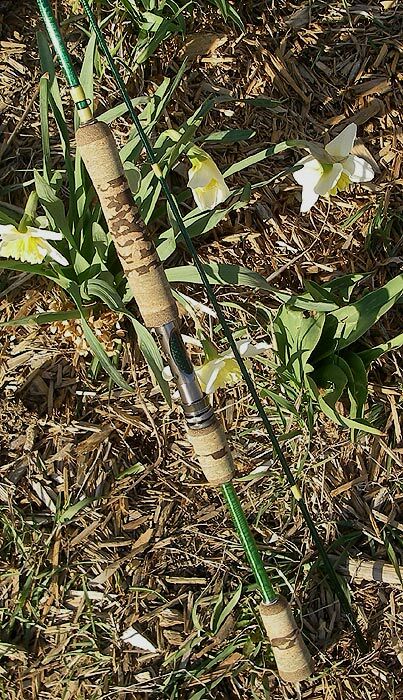 This may rule hike-in, small stream drift fishing, but for the larger streams with good access...this rod is a great performer and one of my favorites! I decided to repeat the split grip I fashioned on the original, chose the green blank this time around, and included some custom created cork grips as well. The use of single foot fly guides on the tip section reduced weight and retained the minute level of "crispness" that this blank possessed in the beginning. The windowed reelseat in titanium along with the green woven graphite insert flows well with the color of the guides, blank, cork and thread accent wraps. 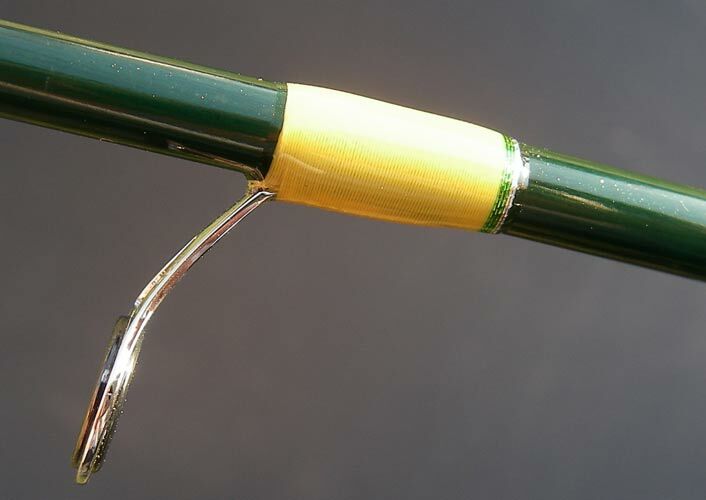 I believe this rod is not for everyone, it is "loud" in its appearance and certainly attracts attention, but I like how it came out and will put it to good use during this year's PA opening day fishing excursion/vacation. The fun of fishing this rod is the inability to 'man-handle' anything of size. 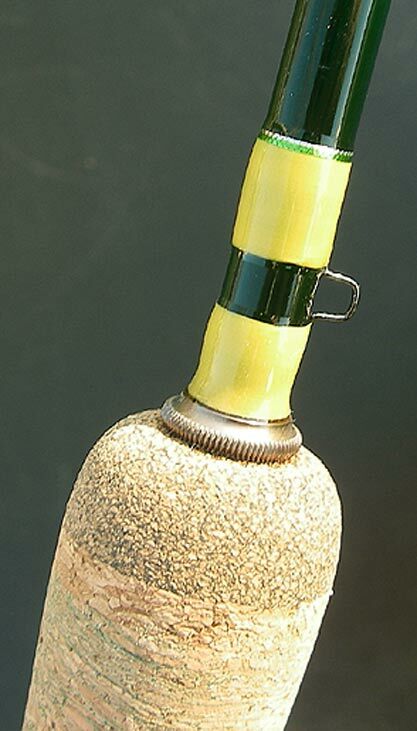 With a larger trout, smallie, or cat...this rod will easily flex down into (sometimes past) the cork grip. It is light, agile, and noodley as can be. I find it a complete blast to fish!